There are few things in life that test’s one’s courage, moving to another country and shifting to a social media platform. Don’t see the similarity?? Here are some: so while you’re excited at the idea of moving and figuring out this new place, you’re likely to have many questions (especially if don’t know many people in the region). You wonder if you figure out the rules and customs and whether you will fit in. How will you mold your home to your liking? How different will it be from your old digs? Will you be able to adjust to the new space? You’re also most likely to wonder if the people there will “like” you, “share” your humor and your anecdotes, “comment” on your moods and become your “friend”. So moving/trying out a new platform is very much like moving to a new country. After being rejected to enter Google+ twice last night, I finally got my visa…I mean authorization. Plus I was excited to see just what Google had come up with to challenge Facebook (my current leading social media poison). My first impression was the fact that it wasn’t as flashy or shiny as I expected it to be. But this is Google, known for its simplicity of design and functionality and its only in test mode at the moment. I was greeted by a site overview and some reading material, which I promptly skipped over. I have moved to three different social media platform, and figured I can figure it out. Maybe I should have read it. One of the interesting parts of Google+ is a key differentiating factor from Facebook, circles. Unlike Facebook, which blasts your update to everyone on your friends page, Google has realized that people want to build some boundaries between their friends. After all you don’t want your boss to know that you were out partying all night yesterday, and opinion on shake shack, and you’re friends don’t care to read you drone on about work. Circles allows you to classify your friends list into distinct groups, so that you can share aspects of your life and opinion to those who would care to know about them. As you can see, while my Google+ page currently has few connections, it does allow you to segregate people into groups. However, one can end up having too many circles and its sort of confusing to add and move people between groups and a very tedious task. So its important to select and build this section wisely. A drag a drop feature would have been much better rather than the current, select and click on the right button to move folks about. The overall interface itself is also very tedious. Similar to Facebook, Google+ has a news feed section that shows you ongoing updates from your groups. But unlike Facebook, It just seems (atleast to me) as though Google+ is lacking in functionality at this point and a certain jenesequa. Yes one might argue that Facebook with its Blue and White is not brimming over with personality, but it has a well laid out structure and ample functionality to engage the user. 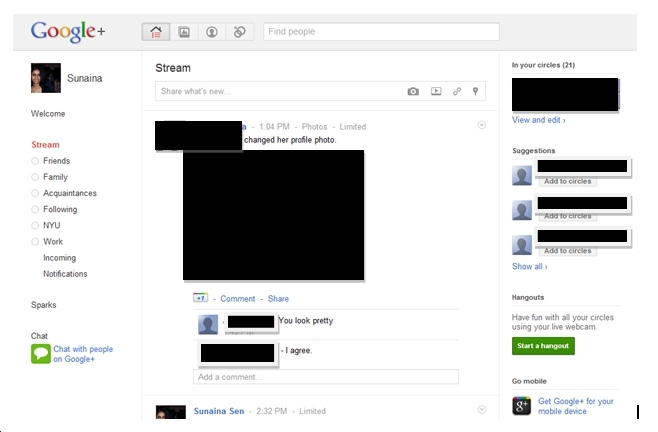 Another interesting feature in Google+ is “Google Hangout” for Skype-like video chats. I also like the way, Google+ is integrated in the header in Gmail providing the user with notifications and updates on their page. Not only does this feature leverage Google’s other products, integrating it into its architecture but also helps draw the user back (increasing stickiness). Since I have only spent a day on the platform this really isn’t my final verdict on the platform, but just some initial thoughts. I will keep playing around and will update this post intermittently. So if you are on Google+ let me know what you think, what new features have you discovered? Most importantly, do you think this is the Facebook killer? Chime in through the comments section. « Older Post Inside the Georgia Aquarium	» Newer Post I have Klout!! – Now why should marketers care? Moving to a new social network is starting afresh. And given the current social networks war, direct portability of friend lists etc. from facebook to google + is not possible. Google + really requires to attract people. 750 million people will not move to google + if they get similar features on ‘more familiar grounds’, and are already comfortable with ‘more familiar grounds’. Like, Facebook’s Skype integration was launched a week after the ‘Hangouts’ feature of Google + came around!. I think there needs to be something really amazing, waiting for Google to pull out the big guns! I dont think attracting people is a problem for Google+. Last time I checked, they already had 10 million users. To its credit, Google+ is scaling very fast and offers several portability functions, partly thanks to Gmail. I do however believe that Facebook has altered expectations from a social networking and in essense the user experience. Opening up its service to developers should certaintly take off some of the pressure it might face. The 10 million users can probably be accounted to the Google + viral that spread across Facebook! Regarding opening up Google+ to developers, I think that has already begun with the acquisition of companies like Punchd. Would be great to see Google’s approach towards developers. True but regardless of distribution medium, the rate of adoption and buzz around Google+ will allow it to attract users. Retaining them is another question. I think the Punchd acquisiton will be helpful for local businesses and part of its Mobile payments platform via Google Wallets. But again acquiring every company under the sun is not sustainable. I meant more in terms of allowing players such as Zynga, and independent developers develop widgets, games, etc for Google+. Similar to what Facebook has done. You’re right. But the fact that the Punchd acquisition happened after the launch of Google+, somehow hints that this might be related to Google’s social strategy. A mobile payment integration of some sort maybe? Like what AmEx did with Facebook recently. I suppose anything is possible. But Google does have multiple products/services, so its not necesarrily connected. I believe the ‘multiple products’ aspect of Google, is its USP. To somehow integrate Google Wallet with Google+ would be awesome! Or to get in Google Earth/ Maps with Google+, like the Foursquare concept maybe? Obviously implemented the Google way. There is a drag drop option for circles. Try it out.